Do you know what today is? Today is a significant day in United Stated history. It is Pearl Harbor Day. On this day in 1941 the Japanese bombed Navy battleships that were docked in Hawaii, killing 2,402 people. 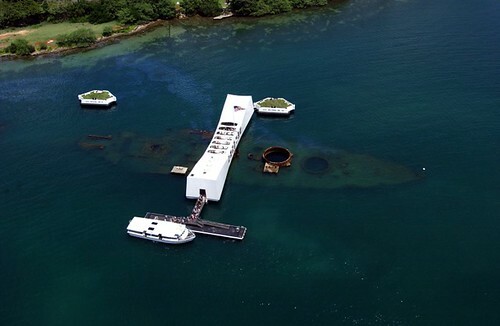 The power of the Arizona Memorial is something that is hard to describe. In 1988 my parents took us to Hawaii on a special vacation. One of the places that was a must see was Pearl Harbor to pay our respects at the Arizona Memorial. Even though I was only going into sixth grade at the time, I still could sense what everything was all about. When you actually go onto the area that is over the ship below, there is an eerie silence. Yeah, and how weird that there was only a little blurb in our local paper, and a wee small little story on the nightly news. How sad.